This is what happens the day after I paint my nails. Every. Single. Time. They just get destroyed! I’ve tried so many brands. I’ve tried the base coats, top coats, anything I can get my hands on in the little Boots near my work. The only time that nail varnish has stayed on my fingernails for more than 2 days without chipping was when we went to House of Fraser and had manicures from Nails Inc.
Am I doomed to a life of having to have manicures all the time? Wouldn’t that be a shame. Damn and blast. I am exactly the same! I like to think it’s because I’m so busy, doing so many things, that my hands get chipped. People whose nails do not get chipped must therefore be lazy. 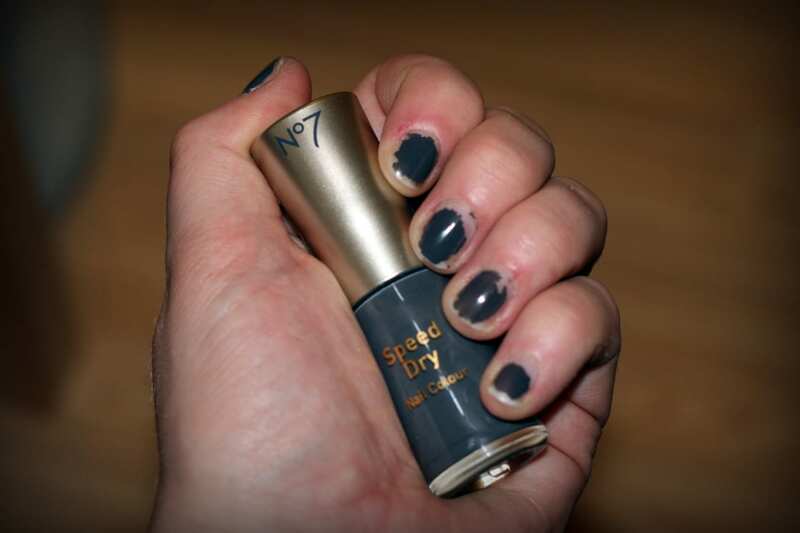 Flippin’ love that colour nail varnish – need to go and dig out that Ã‚Â£5 voucher from Boots! Although I’m currently on a Barry M kick at the moment and have no desire to put anything on my nails that isn’t going to permanently blind at least one person.